A great hostel, a lovely place to stay, and great hospitality. 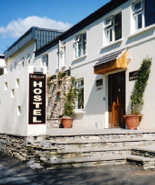 Near the bus and train station the Railway Hostel Killarney is the best located accommodation in the center of Killarney town. It is an ideal base for backpackers, families, groups and tourists of all types to enjoy and explore everything that Killarney town has to offer. We offer 24 Hour Reception so no curfew, Free light breakfast, full kitchen facilities all day, Free Wi-Fi, Discounted Coin Payphone, Free map, discounted local tour bookings, bicycle hire arranged, television area, extensive dvd library, cards and board games available, internet access and Free limited car parking. Our outdoor fountain is the perfect place to relax and converse with fellow travellers on your adventures and experiences in the Kingdom of Kerry.